NOTE: The description of the positions and totems and their meanings given on these pages is meant only as an introduction, and not a complete explanation. Meditate and study further for a more complete understanding. Sun Bear Medicine Wheel is NOT the Medicine Wheel of any Native Nation (Tribe), but comes from a Vision given to Sun Bear by Grandfather. The time of Mudjekeewis is the Evening til Midnite, Autumn, our adult years to elder time. 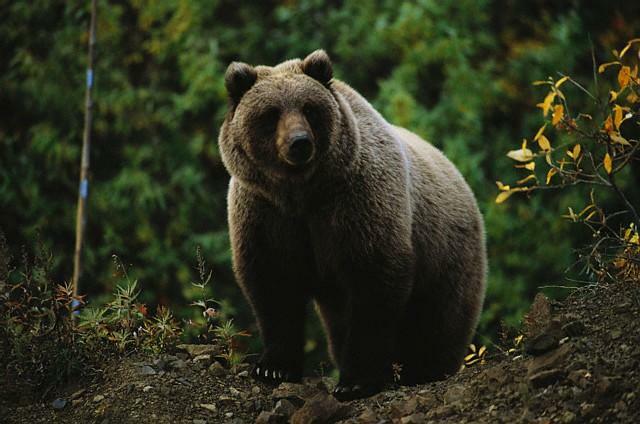 This is the time of slowing down, of taking stock of experiences, of going within, like the Grizzly in autumn, but going within spiritually, to gain strength from the knowledge thus gained; the time to prepare for the times of "winter" or later times. The Stone for Mudjekeewis is placed due West in the outer Circle, exactly opposite the Stone for Wabun of the East. The three Moons of Mudjekeewis are those of Autumn to early "winter": the Ducks Fly Moon, the Freeze Up Moon and the Long Snows Moon. If one of these is "your" moon, then Mudjekeewis and his path or gifts of experience, introspection and strength are the most relevant for you. But remember, all of the Spirit Keepers are there for you, and different assistance is needed at different times. We need to learn as many of the gifts as we can. Excellent article here on Sacred Cedar. Cedar is the plant kingdom totem for the West. The above photo is of Western Cedar. For a picture of Eastern Cedar and very interesting information on the habitat, growth, uses, etc. 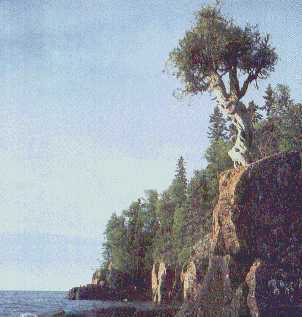 of these trees, check White Cedar (Thuja occidentalis) in "Flora, fauna, earth, and sky...The natural history of the northwoods". The needlelike Cedar leaves are rich in vitamin C; Native Americans and early European explorers used it to treat scurvy, therefore it is also known as Arborvitae, "Tree of Life". Fragrant, pleasing Cedar thrown on the fire, or used as a smudge, putifies, and heals. The mineral totem for Mudjekeewis is Soapstone. There is an excellent article on the characteristics of Soapstone, creating the sculptures using ordinary tools, and by "seeing" your subject in the in the chunk of stone, at Soapstone (part of Cameron Owls, www.owlman.com). 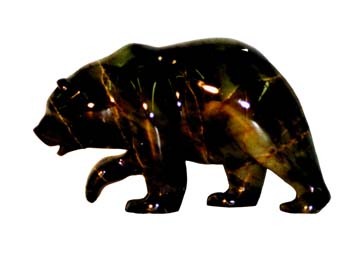 Please click on the image of the beautiful Soapstone Grizzly carving above to see more examples of Nunivak Island carvings. For information about the artist click on his name under the photo. Soapstone has been used for many thousands of years for both Sacred and decorative carvings. Carry on your person and/or meditate with Soapstone to learn about purification, preparation, maturity, responsibility, old knowledge, and strength with malleability. Blue is often the color of evening clouds and sky. The night is usually thought of as Black. Black and Blue are the colors for the Stone honoring the Western Spirit Keeper. Use these colors when you are working on evaluating experience, learning introspection, and developing strength for the times ahead. Please visit Rain Siverhawk's site. especially for those new to the Internet.